BEAM was expected to be fully expanded today. However, due to rising pressure with no visible change in size, other than an initial bulge, ground teams decided to call off expansion for the day. After preliminary inflation, the Bigelow Expandable Activity Module (BEAM) was expected to expand to its full volume today. However, because the process was taking much longer than planned, the ground teams decided to postpone the rest of the expansion procedure in order to assess all the data and determine the right path forward. BEAM was delivered to the International Space Station (ISS) by the CRS-8 Dragon capsule, which launched April 8. It was attached to the aft berthing port of the Tranquility module just a few days later. Since then, it remained in its packed configuration. 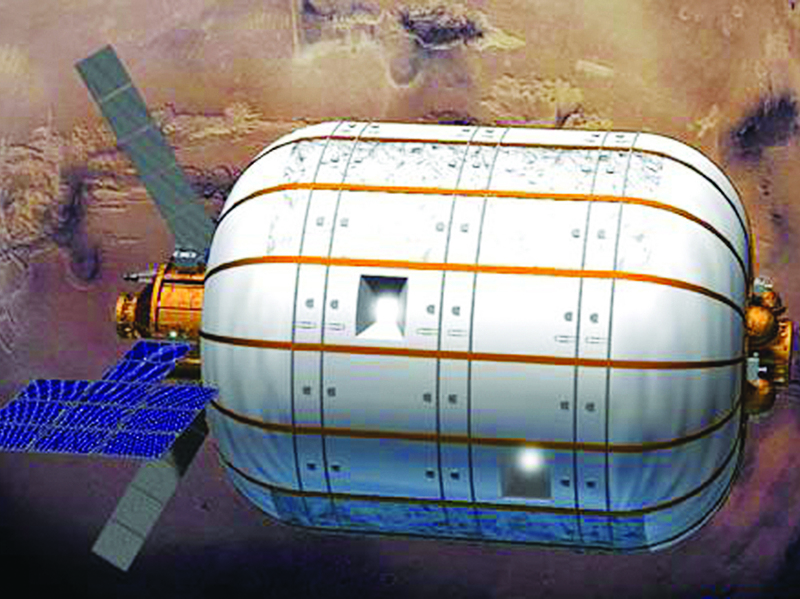 The module will assess the viability of crewed expandable habitats in the future. Today, May 26, ground teams started the expansion process. NASA Flight Engineer Jeff Williams was stationed in the vestibule between Tranquility and BEAM to monitor the process. 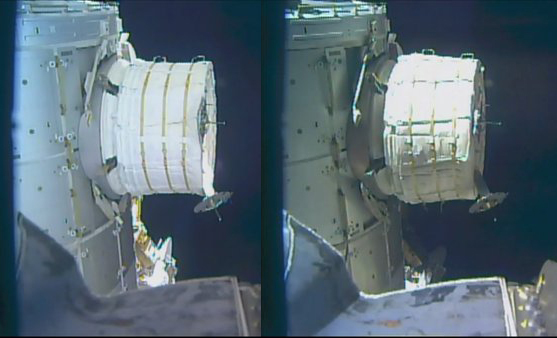 The first step was at 6:10 a.m. EDT (10:10 GMT) when the restraint straps, which kept BEAM tightly packed, were released. After that, Williams let in the first burst of air through a Manual Pressure Equalization Valve (MPEV) on BEAM’s hatch. This resulted in an initial “bulge” at the Tranquility side of the module. The operation took longer than expected as slightly higher pressure than anticipated was observed. Ground teams had to assess the situation and let the pressure settle before continuing with the expansion procedure. Afterward, ground teams gave Williams the go-ahead to add more air via the MPEV in “generous” one-second bursts. However, the module continued to remain unchanged with the initial bulge. Then, just after 8:30 a.m. EDT (12:30 GMT), the ground team called off the rest of the expansion to assess the data. The module expansion could resume as early as tomorrow morning. After the initial introduction of air into the module and the primary expansion is completed, the secondary expansion process will be achieved by tanks on board BEAM itself. Air is not directly pumped into the module itself, but rather inside a bladder system lining the walls. As such, the internal volume will still be in a vacuum. It is not known precisely how the module would expand. There are a number of possible scenarios. The module will increase from its original packed dimensions of 7.1 feet (2.16 meters) long and 7.7 feet (2.36 meters) in diameter to a pressurized dimension of 12.2 feet (4.01 meters) long and 10.6 feet (3.23 meters) in diameter. The total expanded volume is will be 565 cubic feet (16 cubic meters). After expansion is confirmed successful, air will then be pumped inside BEAM via the onboard tanks. After that, over 80 or so hours, ground teams will monitor pressure to assess if there are any leaks. If everything checks out as normal and safe, astronauts will enter the module to set up sensors for data collection. 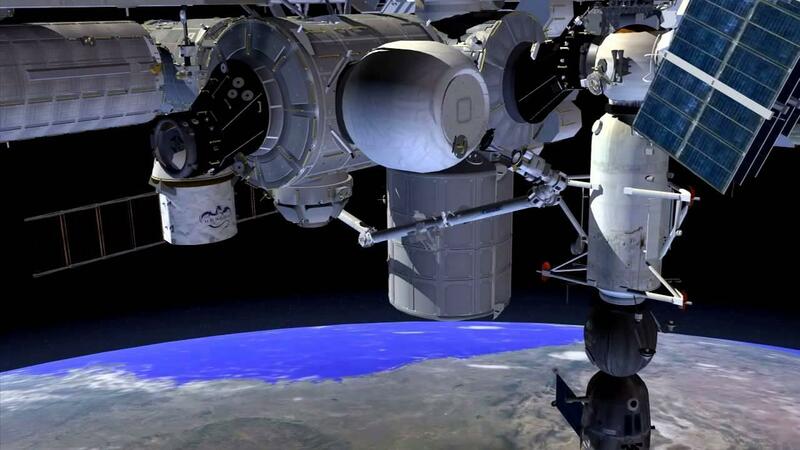 This will be the first time that astronauts have entered an expandable module in space. It was expected that crews would begin entering the module on June 2; however, with the delay, it is unclear if that date will hold. 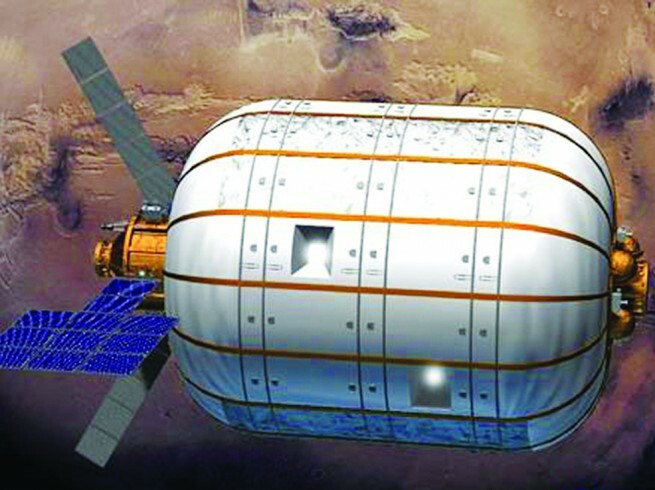 The concept of an expandable module has been around since the beginning of the Space Age. However, it wasn’t realized until 1997 when NASA began development of the TransHab concept. It was designed as an alternative to a more conventional rigid habitation module. TransHab was ultimately canceled in 2000, due to rising costs and delays with the ISS program. The Habitation module would also be canceled. The story didn’t end there, however. Bigelow Aerospace, founded in 1999 by Robert Bigelow, purchased the rights to the NASA TransHab patents. The company then began developing their own expandable modules with private funding. The first test articles launched in 2006 and 2007 in the form of Genesis 1 and 2, respectively. They were small modules, both launched atop a Dnepr rocket. The tests were deemed a success, and now, after 10 years in orbit, both have retained pressure and integrity showing long-term habitats are viable. BEAM is the next step in testing the concept. Over the next two years, it is expected to remain sealed off from the rest of the station with astronauts entering it every once in a while. Inside are sensors that will monitor pressure, debris impacts, temperature, and radiation levels. According to NASASpaceflight.com, research has shown that expandable modules might have better radiation shielding than metal modules due to the use of vinyl polymer material utilized in building the module. Additionally, these modules could also be better suited to absorb debris impact. BEAM is small with respect to the rest of the ISS modules. It has two bulkheads at either end and multiple layers of impact-resistant material. Additionally, it has a small Common Berthing Mechanism hatch, rather than the standard size. Bigelow Aerospace’s next ambition is to use the data to build and fly a much larger stand-alone space station called B330. It is a single 11,650 cubic feet (330 cubic volume) module can be used as a space station by itself (as it is expected to have its own propulsion and life support). It can also be attached to the ISS as another module. Last month, Robert Bigelow and United Launch Alliance (ULA) CEO Tory Bruno announced a partnership between the two companies, the specifics of which were vague. What is known is Bigelow wants to use ULA’s Atlas V rocket to launch their B300 module as early as 2020. According to Bigelow, the Atlas V is the only launcher with a payload fairing volume capable of encapsulating a packed B330. After remaining on the station for two years, BEAM will be unberthed by the station’s robotic arm and pushed in a safe trajectory away from the outpost where its orbit will eventually decay into the Earth’s atmosphere to burn up. From the pictures it looks like the module has 3 tie-down straps wrapped around it, possibly placed on the module to secure it during transport but intended to be removed and stowed after being placed on the ISS. From what I’ve read elsewhere, they were pyrotechnic releases. Makes you wonder if they didn’t release completely. If that’s the issue, I suppose an EVA with some cutting tools might be in order. OK, I hope they’ll manage to fix it without the whole thing blowing up unexpectedly.